Hi! I’m Brittany Mullins, a full-time online marketing gal and part-time holistic health coach living in Richmond, Virginia. I’m also the author of Eating Bird Food, a healthy living blog that features nutritious (and tasty) recipes, workouts and a glimpse into my daily life, which is currently being taken over by wedding planning. One of my favorite things about spring and summer is all the seasonal produce. 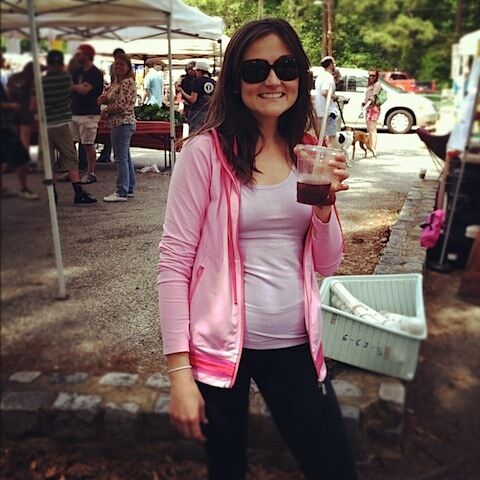 Saturdays from May – October my fiancé and I wake up early to explore our local farmers market. We sip coffee, taste a few samples or have breakfast, buy produce and other locally made goods and give our dog, Olive, a chance to meet and greet some other pups. It’s something we look forward to each week. I love shopping at farmers markets. However, I can see how it could be a little intimidating for those who have never been. 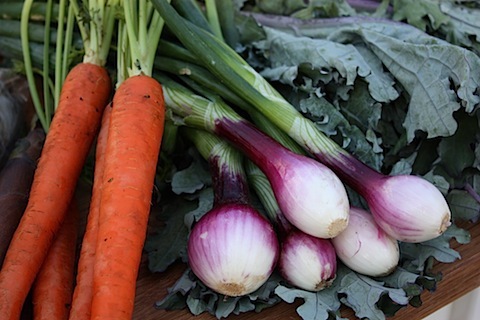 So, today I want to share some of my favorite tips for a successful farmers market adventure. Do a little research. Visit localharvest.com to find farmers markets nearby. Check their days/hours and visit a couple to find out which ones you like best based on the location and vendors. We have quite a few in Richmond, but my two favorites are the South of the James Farmers Market and The Market at St. Stephen’s. Both of which are open on Saturday mornings from 8:00AM-12:00PM. Try to arrive earlier rather than later. Popular items often times sell out fast so head to the market early – you’ll beat the crowd and get the best selection. Bring some reusable bags and definitely stop by the ATM before heading to the market. Some vendors take credit cards, but most of them only accept cash. It’s fun to come hungry – often times farmers markets have coffee, food trucks and samples. If you come hungry you’ll be more likely to try something new. Talk to the vendors/farmers. If you’re interested in natural, organic produce ask how their produce is grown. Often times, small farmers adhere to organic growing principles but can’t afford the official certification. Try at least one “new-to-you” item. Farmers markets have some obscure items that you might not know what to do with. Pick one out, ask the farmer about it and then research recipes online. Who knows, you might just find your new favorite fruit/veggie. Go beyond produce. Some of my favorite items to buy at the farmers market are flowers and freshly baked breads but you’ll also find meats, eggs, cheeses and other tasty delights. Most markets also have vendors that sell crafts and baked goods. Handmade artwork, jewelry, candles and sweets make great gifts! Shop around before deciding to buy. Nothing is worse than buying produce at one stand and finding the same item is cheaper or fresher from a vendor two tents down. Bring a list with a few ideas of what veggies you need, but also be willing to compromise once you see what vegetables are available and look the best that week. Make a date of it! Go with your hubby/boyfriend/best friend and enjoy yourself. It’s fun just to walk around and explore what local farms are producing in your area. Do you shop at your local farmers market? What are some of your favorite items to buy? First off all, we want to give a huge thanks to Wholesome Goodness for sponsoring our “Mock-tail” party this afternoon! We had a great turn out of Virginia Bloggers, with quite a variety of dips! I can’t wait to try some of those recipes!! If we’re playing favorites, I’d have to say the Multigrain and Flax Tortilla Chips are amazing. They pretty much go with ANY dip, in my opinion… but some of my favorites included Mollee’s pesto dip, and Gabby’s salsa! Wholesome Goodness also sent us some of there salsa, and it’s delicious as well! We sampled both the Pomegranate juice as well as the Pomegranate Blueberry & Acai juice. I think my favorite mix was 1 part part club soda, 1 part lemon lime soda, and 1 part Pomegranate Blueberry & Acai juice! And just in case our bloggers didn’t get enough Wholesome Goodness at the party, we were able to send everyone home with a some trail mix! The Tuxedo Mix is one of my all time favorites! Thanks again to Wholesome Goodness and all the bloggers that were able to make it to the party! Keep checking the events page for summer announcements, and make sure you follow us on twitter, for all the updates! Hi again! It’s Adrienne. You may remember me from my healthy snacking post back in May. Not only do I like to attempt to take good care of myself but I also enjoy helping others. I strive to regularly volunteer and this past weekend I had the opportunity to do so over at Lewis Ginter Botanical Garden. In the back of the park hidden from the regular visitors, they have almost an acre of gardens that produce vegetables for FeedMore’s Community Kitchen. This year they hope to produce 10,000 pounds of crop. Last year they only missed the mark by about 80 pounds! The garden depends heavily on volunteers to help with all tasks from tilling the land to harvesting at the end of the season. I enjoy gardening at my own house so I thought it’d be fun to help out. We spent the morning moving through various tasks. The first thing we did was check squash plants for squash bug eggs. It’s a tedious but necessary task that helps prevent the bugs from killing the plants. To get rid of the eggs, we snapped off any leaves that held the tiny, copper-colored eggs. Pretty easy to do and rewarding. We planted tomatoes next. Many plants are grown from seed on site but others are often donated like the ones we dealt with. We planted about 30 plants in a very short amount of time. It’s amazing how much you can achieve with a good amount of volunteers! I really enjoyed the morning – talking to the other volunteers and learning a little from the head gardener all while helping the community. I hope to visit again soon. It’ll be fun to see the results of our work! If you’re interested in joining me one Saturday, please visit Hands On Greater Richmond to sign up. I usually click on the ‘Project Calendar’ at the right-hand side of the page to find opportunities. On the calendar you’ll see that you can volunteer at Lewis Ginter every Saturday and Monday for the next couple months. You don’t need any experience to come help! Just wear some clothes that you wouldn’t mind getting dirty, closed toe shoes and bring gardening gloves if you have them. Water and sunscreen are good to have too! Feel free to email me at hippieitch [at] gmail [dot] com if you have any questions or comments! Today’s guest blogger, Chelsea, is a girl after our own heart tastes! This Arlington blogger is not only adorable, but also has great ideas for healthy living! We’re so happy she’s sharing a favorite recipe of hers with you all today! Hi there! My name is Chelsea and I blog over at Chelsea Eats Treats. I am a new resident to Arlington and I blog about my journey of trying to balance a healthy lifestyle with a love for desserts. Every day I post about my workout (which usually includes a run with my black lab and an Insanity DVD) as well as a recipe for something I made that day. Most of my recipes are lightened up comfort foods, such as Thai turkey burgers with peanut sauce, light creamy chicken and rice soup, and peanut butter banana oatmeal cookies. I believe eating healthy should be a lifestyle change, not a temporary fix to look good in a bikini, so I post recipes I could eat for years without feeling like I’m missing out on my favorite foods. For example, today I want to share a healthy ice cream recipe with you. I believe you should never have to give up the foods you love in order to be healthy; you may just have to eat them in moderation or find a similar, healthier, alternative. Take soft-serve ice cream, for example. Everyone loves the creamy, sweet flavor of ice cream, but there’s no way you could live a healthy lifestyle by having it every night for dessert. However, if you could make a healthier ice cream that came together in seconds and barely cost you anything, you’d want to try it, wouldn’t you?? First, freeze your bananas next time they start to turn a little brown and you don’t think you’ll get around to eating them. It’s probably best to peel them, cut them up into about 4 pieces, and freeze them in a Ziploc bag, but if you’re too lazy like I am and only remember to freeze them as you are running out the door, you can put them in the freezer with the skin on. Don’t worry if they turn extra brown in the freezer; that’s normal. Then, when you are ready to make your ice cream, peel the frozen banana (this where having it already peeled will help; sometimes you need to let it thaw first to wrestle the peel off) and place it into a food processor with some honey and peanut butter. I like to use organic, natural honey and either all natural or reduced fat peanut butter, but use whatever kind you want. When everything is in the food processor, give it a whirl until all the ingredients are blended smoothy and the mixture resembles ice cream. Then pour the mixture into a bowl, and you’re ready to serve! See, wasn’t that super easy? Of course at this point you can add any extra toppings you want (chocolate chips, sprinkles, nuts, or even chocolate sauce) but it tastes great as it is! The peanut butter banana combination is obviously a delicious one, and the honey just gives it a little extra sweetness. It’s crazy how when bananas are frozen their consistency changes to a creamy, ice-cream-like texture. It’s so good! This creamy ice cream is made from good-for-you ingredients like bananas and honey! No one will know there’s no extra cream or sugar! So, that’s it! I hope you liked this recipe and will stop by Chelsea Eats Treats to see what other creations I’m coming up with. Thanks so much for your time today!